For more than 20 years Ra Paulette exiled himself in New Mexico to pursue his passion for art. 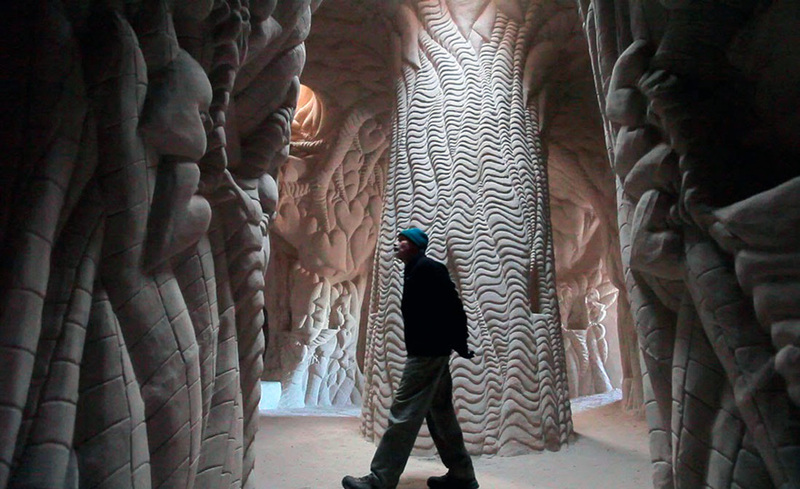 In the enclave of sandstone caves and fields of New Mexico, he created mindblowing structures. Much more surprising is the fact that he did the carving alone, without any helping hand. Ra Paulette is a very eccentric man and his passion for carving seems to be unrivaled. The quarter of his life is enough to prove it. He called his valued creations as wilderness shrines. Armed with pickaxe and wild imagination he filled sandstone caves in New Mexico with his wilderness shrines. Documentaries such as the 'Cave Digger' featured Ra's sandstone carving techniques and his views on art and it's universality. Ra's art style can range from patterns that resemble Maurits Escher's style to H.R Giger's hooks. Had the sandstones colored pitch black, Ra's wilderness shrines can be used as a set for an 'Alien' film. The video below shows Ra's style in creating his shrines.